To enable developers to build for the intelligent edge, Custom Vision Service from Microsoft Cognitive Services has added mobile model export. Custom Vision Service is a tool for easily training, deploying, and improving custom image classifiers. With just a handful of images per category, you can train your own image classifier in minutes. Today, in addition to hosting your classifiers at a REST endpoint, you can now export models to run offline, starting with export to the CoreML format for iOS 11. Export will allow you to embed your classifier directly in your application and run it locally on a device. The models you export are optimized for the constraints of a mobile device, so you can classify on device in real time. Custom Vision Service is designed to build quality classifiers with very small training datasets, helping you build a classifier that is robust to differences in the items you are trying to recognize and that ignores the things you are not interested in. With today's update, you can easily add real time image classification to your mobile applications. Creating, updating, and exporting a compact model takes only minutes, making it easy to build and iteratively improve your application. More export formats and supported devices are coming in the near future. 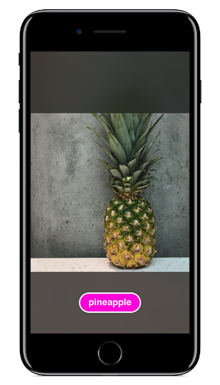 A sample app and tutorial for adding real time image classification to an iOS app is now available. To learn and starting building your own image classifier, visit www.customvision.ai. Screenshot of a fruit recognition classifier in our sample app.